This is beautiful downtown Randsburg. What can be referred to as a living ghost town. The population is about 150 people but at one time in the early 1900's was about 3500. 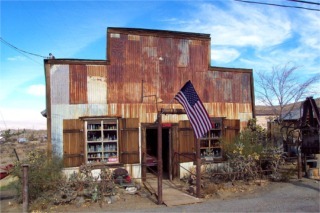 It is one of many old mining towns in California that started just before 1900 when gold was discoverd. Then as the gold ran out or because of the war the mines were closed. As we were walking the street, yes Karen is a street walker, the proprietor of this fine establishment informed us that some of the antique shops might open up. It all depended on how the individual felt that day. He told us if we mosied on down toward his store he was going to get up and come down and open it up. Wow.. what a life and attitude. They sure took things a lot slower in Randsburg. He also informed us that on a Saturday most of the stores would open but not all of them. Hmm maybe this was a ploy to make us think if he did happen to come down and open we better buy because we might not get any other opportunities. The name of this church is Santa Barbara. I couldn't find anything to tell me the denomination though. It sure makes for a great photo. There is also a museum, a branch of the Kern county museum, but it wasn't open while we were there. There is a great general store you have to go in to see. What a throw back in time. Besides that there is a bed and breakfast too. We're going to have to go back again and stay here. Things are just so much slower and relaxed. There are many abandoned mines in the area and many that are working. I actually picked up a rock here where you could see the gold sparkle in the rock among a vein of quartz running through it. It's fun to go poking around in these old ghost towns. You never know what you might turn up. While we were kicking around this mine a family came driving by on dual purpose motorcycles. Hmmm did that look like fun. I'm going to have to talk Karen into riding one. What a great way to go exploring. There is abandoned equipment all around. This old engine was either used to power a crusher mill or power a generator for electricity.